This accommodation cannot yet be booked on SleepOut.com. Find more accommodation options in Seychelles. 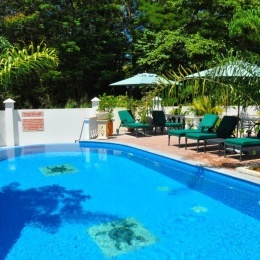 Hanneman Holiday Residence is a just a short walk to Beau Vallon Beach. Here you will find 3 kilometers of white sand and warm turquoise-blue waters of the Indian Ocean. There is a selection of watersports where you can enjoy free non-motorize water sport equipment (collect a voucher at reception) and dive centres, take-aways and shops and restaurants serving Creole cuisine such as fresh fish, curries and salads. For those who enjoy night life a 5 minute drive will take you to a variety of evening entertainment such as a discotheque, casino, folklore and music shows. Our multi-lingual staff speaks English, German, French, Dutch, Afrikaans, Creole as well as some Italian and Spanish.